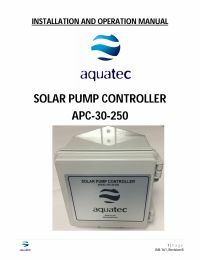 Aquatec APC-30-250 Solar LCB Pump Controller is designed specifically to interface between a photo-voltaic array, and the Aquatec SWP series submersible pumps. This controller features a solid-state power converter that protects and enhances the capabilities of the solar well pump. The APC-30-250 extends the pumps run time by using a current booster, provides protection from excess power surges, and prevents dry-running. 6.55" x 6.13" x 3.75"